Raleigh City Hall is located at 222 West Hargett Street, Raleigh NC 27601; phone: 919-89--3040. Photo: Dodd-Hinsdale House, ca. 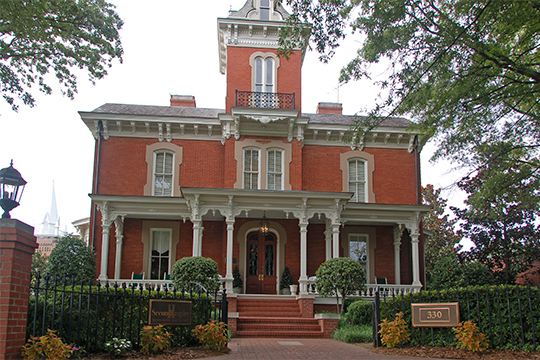 1879, 330 Hillsborough Street, Raleigh, NC. Listed on the National Register of Historic Places in 1971. Photographed by User:Mark Turner (own work), 2010, [cc0-by-1.0 (creativecommons.org/publicdomain/zero/1.0/deed.en], via Wikimedia Commons, accessed January, 2014. Raleigh was officially established as the Wake County Seat and the North Carolina State Capital in 1792. It is one of a handful of U.S. cities entirely planned and built specifically to serve as a state capital. A small portion of the City of Raleigh lies within Durham County. The [North Carolina] General Assembly of 1787, sitting at Tarboro, in providing for calling a Convention to consider the adoption of the Constitution of the United States, recommended the people of the State to "fix on the place for the unalterable seat of government." The Convention, which met at Hillsboro in 1788, resolved that "this Convention will not fix the seat of government at one particular point, but that it shall be left to the discretion of the General Assembly to ascertain the exact spot, provided always that it shall be within ten miles of the plantation whereon Isaac Hunter lived, in the county of Wake." In 1791 an act was passed by the General Assembly to carry the ordinance of 1788 into effect. It was provided that nine commissioners be appointed to lay off and locate the city within ten miles of the plantation of Isaac Hunter, in the County of Wake, and five persons "to cause to be built and erected a Statehouse sufficiently large to accommodate with convenience both houses of the General Assembly, at an expense not to exceed ten thousand pounds." This historic tract of Isaac Hunter lies about three and a half miles north of Raleigh, on what was once the great road from the North to the South by way of Petersburg, Warrenton, Louisburg, Wake Court-House to Fayetteville, Charleston and other points. The act provided for one commissioner from each of the eight judicial districts, and a ninth from the State-at-large. The following were elected: For the Morgan District, Joseph McDowell, the elder; Salisbury District, James Martin; Hillsboro District, Thomas Person; Halifax District, Thomas Blount; Edenton District, William Johnston Dawson; New Bern District, Frederick Hargett; Fayetteville District, Henry William Harrington; Wilmington District, James Bloodworth; State-at-large, Willie Jones. Willie Jones, of Halifax, was the leader in the State of the anti-Federalists, a member of the Provincial Congress at New Bern in 1774, and chairman of the Committee on Safety in 1776. He refused to accept a seat in the Constitutional Convention of 1787 at Philadelphia, and led the party in the State Convention of 1788 opposed to the adoption of the Federal Constitution. He eventually removed to Wake County, and bought, the plantation now owned in part by the St. Augustine Normal School. It was on this place he was buried, but there is now no stone to mark the spot. Frederick Hargett was for many years Senator from Jones. James Martin was a colonel of militia in the Revolution, and participated in winning the victories of Moore's Creek Bridge and Guilford Court-House. The deed from Joel Lane for the land purchased for the capital was to James Martin in trust for the State. Thomas Blount, of Edgecombe, had been a Revolutionary officer. He was the same year elected to the National House of Representatives, and afterwards represented Edgecombe in the State Senate. Thomas Person, of Granville, was a general of militia in the early Revolution, and afterwards represented his county in the General Assembly. He was a benefactor of the University, and in his honor the County of Person was named. James Bloodworth, of New Hanover, had often represented his county in the General Assembly. He was a son of Timothy Bloodworth, a gunmaker, and was afterwards Speaker of the House of Commons (as the House of Representatives was then termed), a Representative in the Congress of the Union, and a United States Senator. Col. Joseph McDowell, the elder, of Burke, was distinguished for his services in the Revolution, and for being a leader of the anti-Federalist party in the West, opposing, in the Conventions of 1778 and 1789, the proposed "immediate and unconditional ratification of the Federal Constitution." William Johnston Dawson, of Chowan, was a member of Congress and a man of great influence in the Albemarle country. Henry William Harrington, of Richmond, was an officer in the Revolutionary struggle. He was a member of the Legislature and famed as a planter of immense estates and baronial style of living. The following were chosen as the Building Committee: Richard Benehan, of Orange; John Macon, of Warren; Robert Goodloe, of Franklin; Nathan Bryan, of Jones, and Theophilus Hunter, of Wake. The ordinance locating the seat of government in the County of Wake. The first to suggest "Raleigh" as the appropriate designation for the future capital was Governor Alexander Martin. James Iredell afterwards had the distinction of being honored with a seat on the bench of the United States Supreme Court, and is to be distinguished from James Iredell, his son, who was Governor in 1827, and at the time of his death, at an advanced age, a resident of Raleigh. The commissioners were directed to purchase not less than six hundred and forty nor more than one thousand acres, and to lay off a town of not less than four hundred acres. The main streets — Fayetteville, Halifax, Hillsboro and New Bern were required to be 99 feet, the remainder 66 feet wide. Twenty acres or more were to be allotted for public squares. The commissioners were to be allowed twenty shillings (two dollars) per day and expenses. The same commissioners who located the city made the first sale of lots, one acre each. The square on which Dr. Hogg lived, bought by General Davie, brought $254 — the two lots fronting on Wilmington Street, $60 each; the two others on Blount Street, $66 and $68, respectively. The lot (No. 211) on which the Supreme Court and Agricultural buildings are now situate brought $263. At this sale, Treasurer John Haywood (grandfather of Mr. Ernest Haywood) purchased the site on which the latter now resides (on New Bern Avenue), and in 1793 erected thereon the house which has been the residence of the Haywood family to this day. Raleigh is situated about the center of the State, a little to the northeast of the geographical center. It is located in a gently rolling region of the oldest Laurentian system. Average temperature: Spring, 58.7; summer, 77.6; autumn, 61.0; winter, 43.2 — comparing favorably with Los Angeles, Mexico, Naples, and Rome. During the Civil War it was designated by a board of eminent surgeons, appointed to select sites for hospitals, as one of the several sites in the State most suitable for that purpose, because of its remarkable salubrious climate, combining as far as possible all influences conducive to convalescence of invalids and health of attendants. The fine old trees which were spared by the original settlers, but rapidly disappearing with city improvements, gave it the sobriquet of the "City of Oaks." At the southeast corner of the Capitol Square, it will be observed, there are three large stones set in the earth, being about four feet apart and all apparently three feet in height. Between two of these stones, and nearly level therewith, is another though smaller stone, into which is cut a cross mark, representing the points of the compass. The question is frequently asked concerning the significance of these stones and mark. The answer is found in the reference to the longitude and latitude of the city. This was officially determined many years ago, under direction of the United States Geodetic Survey, and these stones were then erected to mark the spot from which the officials took their reckoning. The altitude of Raleigh is 363 feet, denoted by an inscription on a small copper plate, set in the cornerstone of the capitol, on the northeast corner of the building. This was authorized by the United States Geological Survey, which, through its engineer, Mr. W. Carvel Hall, obtained permission from Governor Carr in 1876, to make a permanent record of this fact in the manner above mentioned.